MS Lofoten, our old time favourite, was launched in Oslo in 1964, and provides you a voyage of real nostalgia and intimate informal atmosphere. The ship is named after the Lofoten Islands justnorth of the Arctic Circle, famous for their dramatic scenery and often described as ‘a masterpiece’. MS Lofoten is the second Hurtigruten ship to carry this name. 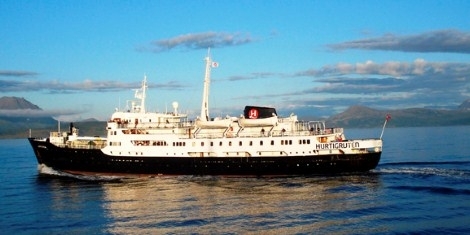 She was refurbished and refitted in 2003, but most of the original style and atmosphere are preserved. With unique lounges and panoramic decks, this ‘old lady’ is simply incomparable. The cabins are plain, but very cosy. 5 night cruise sailing from Kirkenes aboard the MS Lofoten. cabin, 6–8 m2, upper and lower berths. Shower and wc.